Most time when you go to the race track, the cars, crews and drivers have to do the most work during the evening. On Thursday night, the rollback did the most work. The opening night of SpeedFest at USA International Speedway in Lakeland, FL had more of a “demolition derby” feel than the feel of a Super Late Model show featuring some of the best racers in the entire country. 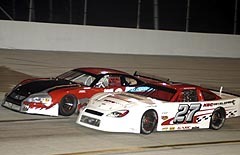 It started early in the night’s “Last Chance Race” when several cars, including Midwest hotshot Erik Darnell, were involved in a lap two accident that took out six cars. The night’s 100-lap feature had to go through a complete restart not once, not twice, but three different times. First, Josh Hamner got punted into the turn two wall just after the green was dropped. 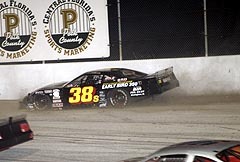 On the same lap, as the cars roared down into turn three and four (and as the caution was coming out due to Hamner’s accident), 2004 CRA Champion Chuck Barnes Jr. got run into by Eddie Van Meter, knocking both out of the race. The green following the second complete restart lasted until turn three, when at least eight cars were involved in a big mess. 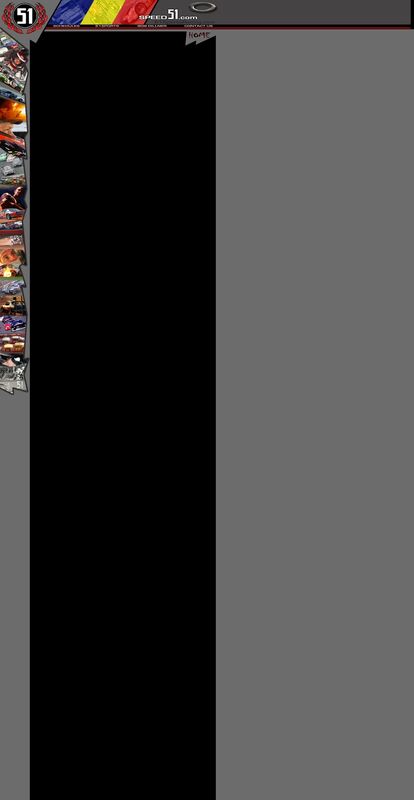 Taken out in that accident were the likes of Eddie Massengill, Scott Hantz, Ben Rowe, Johnny Brazier, Greg Davidson, Mike Rowe and Sean Murphy. The third time was finally the charm. 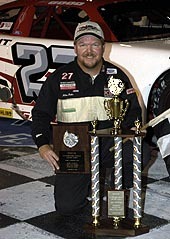 Jeff Choquette, who’s dominated Super Late Model racing in Florida over the last few months, jumped to the early lead after starting on the outside pole following the mandatory inversion (Mario Gosselin earned the pole, but drew an eight, putting Pat Kelly and Choquette on the front row) and held that top spot until the night’s second quick qualifier, Mike Fritts, shot to the lead. Following that change for the lead, Fritts checked out. That is a scary thought considering Fritts dominated the rest of the 100-lap event, holding off Gosselin following two late cautions. At one point, Fritts nearly had a half-lap lead on the entire field. It was even more special for Fritts, as he wasn’t suppose to be in the car for the weekend. Gosselin fought his way back from his eighth-place staring spot to finish second. However, Fritts, who started seventh, made his way through the traffic better. But the big talk of the night was the extreme number of damaged and nearly destroyed cars that litered the pits following the race. Some of the damage to a few cars was so severe, it will casue several big names to have to head home early. “Right before the race started, I went over and talked to (Eddie) Van Meter,” said Barnes of his first lap accident. “I know how he drives and I told him this is the only car I have for the weekend. I asked him to take it easy and get through the first 10 laps and if he was still right there, I’d let him go. We didn’t get that far. We just have to load her up and take it home. Darnell, who was involved in the big one during the last chance race, said they will likely load up and head home too. They were still evaluating their repairs. Charlie Bradberry, who was involved in a very hard accident around lap 86, will also load it up and head home early. 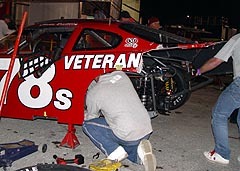 That someone was Dave Jackson, who nearly took the entire rear end off of Bradberry’s car. Bradberry thought Charlie Menard was the driver that got into him coming off of two. “There are no marks on the car,” said Menard. “He was upset with me. He thought it was me. I had to tell him that is wasn’t me. I didn’t get into him. The finger was also pointed at Menard following the first accident of the night, the one that took out Hamner. 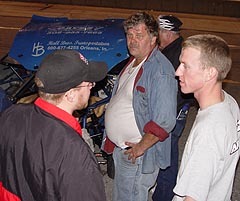 “The first lap, I saw the black 10 car (Ryan Foster) not get a good start like he spun the tires,” said Hamner. “We got down here to two and the 13 (Menard) went down to the bottom and made it three-wide. I was on the outside. It happened so fast, I didn’t really have time to do anything. Into the wall I went. Fain Skinner also loaded it up early and will head home, as will Matt Hawkins, who wrecked in qualifying. Several other drivers, including Murphy and Gordie Ryan, were evaluating the damage to their cars to see if they could make it back. Ben Rowe was involved in one of the early accidents and had to cut his night short. “They were all crossed up in front of me. That is all I know,” said Rowe. “I don’t know what really happened. I think it was Scott Hantz or someone was all crossed up and came right down in front of me and there I was. It all happened so fast.